EISA focused on building the capacity of political parties to strengthen their internal structures, in particular to be more internally democratic and inclusive, as well as to promote greater inclusivity of women. 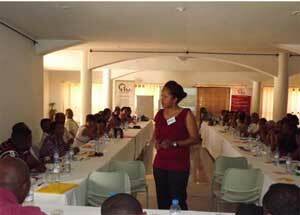 This was effective during a first workshop held in July attended by 12 political parties in Antananarivo, a second workshop in Toamasina in August attended by 10 political parties and a third in Mahajanga in September with 15 political parties. EISA monitors the promotion of gender equality in political parties by contacting each political party leader who has designated a focal point. Monthly contact are made with the focal point to monitor progress such as the number of women having positions in political parties as well as measures being introduced to promote gender promotion in the party.